BANGI, Mar 9 2014 – The National University of Malaysia (UKM) which has set up a student entrepreneurial square known as Teres Eko Niaga to give entrepreneurial exposure to students so as to encourage them to do business as a career option after graduation. Vice Chancellor Prof Datuk Dr Noor Azlan Ghazali said today the square needed to be tidied up and used as a centre where a variety of projects and various activities including arts projects can be carried out. 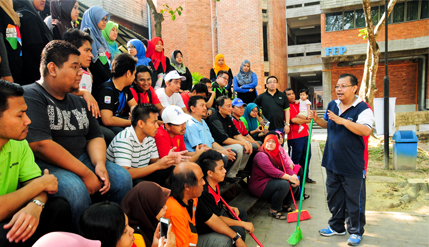 He urged the students to ensure the square is hygienic and clean at all times to encourage those in UKM and nearby areas to patronise it and be a place where the students can be proud of. He was taking part in a gotong royong to clean-up the square. Also taking part were Deputy Vice Chancellors (Academic and International Affairs), Prof Ir Dr Reza Atiq OK Rahmat Abdullah, (Students and Alumni Affairs) Prof Datin Noor Aziah Mohd Awal, Bursar Haji Mohd Abdul Rashid Mohd Fadhil, Deans of Faculties and senior officers of the university. Prof Noor Azlan said if the standard of hygiene and food could be improved it would attract more people, especially visitors to come to UKM. He said the square can be proof of the ability of UKM to produce talent, creating entrepreneurial opportunities and should also be made sustainabe. “This is a UKM prototype of a business model to the country and the world. I firmly believe there is room to turn the Teres Eko into a business haven. The Department of Student Services may be the coordination centre, but all in UKM can support by watching over the place. “Success of Teres Eko is the success of all of us. Anybody with ideas on how to improve it should share them. Invite the faculties, centres and other entities to contribute,” he urged. The Teres Eko Niaga was built near the Faculty of Economics and Management at the end of 2007, the result of collaboration between UKM with the then Ministry of Entrepreneurship and Co-operative. The Student Development Centre had been responsible for building, managing and monitoring its business operations. The main goal of the Teres Eko is to give entrepreneurship exposure to students, to encourage them to embark on business ventures upon graduation. The Vice-Chancellor expressed the hope that with the establishment of training and experience in entrepreneurship, many more graduates will pursue commerce as a livelihood and help the country to be able to meet its target of becoming a developed nation by the year 2020.